The Khalil Mamoon Mini Prince Ice Chamber is a hand engraved, detailed heavy metal hookah that is perfect for anyone who wants a hookah that will last from years to a lifetime. The included glass vase perfectly accents this gorgeous stem. 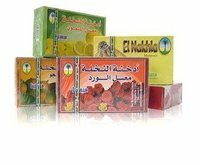 It was handmade in Egypt by a team of skilled craftsmen who specialize in creating the highest quality hookahs available today. Khalil Mamoon has been producing their beautiful hookahs since the 1800s, so it's no wonder why their quality is number one. This hookah comes with an ice chamber to allow for optional cooling for a perfect smoke session. Variation Warning All KM Hookahs Are Unique And The Stem, Vase, And Hose Patterns And Colors May Vary From The Color Selections and Photograph Listed Above. Click Here To Contact Customer Support If Further Clarification Is Necessary Prior To Ordering This KM Hookah model. 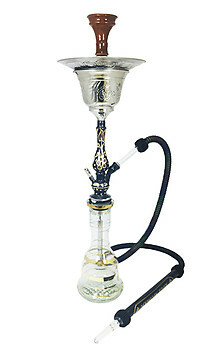 This KM Hookah model may also come in an all Gold stem instead of Silver stem as listed in the photograph above.